I’ve heard from a lot of gardeners this year that they had a poor tomato year. On one hand, I know that some of my tomato plants at home struggled as well. On the other hand, most of our plants in the Demo Garden did very well. My theory is that due to our rainfall this year, most average gardens were constantly losing nitrogen to leaching and the plants showed it. My plants at home were never as vigorous and lush as I would expect, and I blame it on lack of fertility. 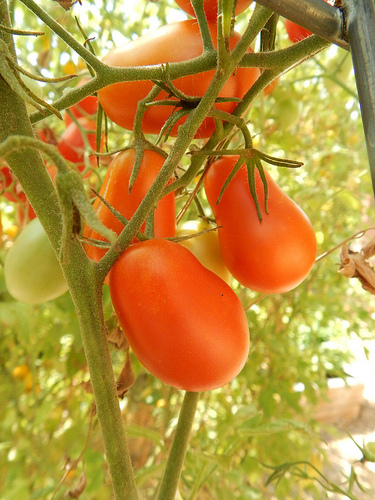 Why did our Demo Garden tomatoes thrive? I think the fact that we incorporated 3-5″ of compost into the beds in the spring played an important role. We didn’t even add additional fertilizer, and the plants looked good all year long. I suspect that had we NOT had a rainy year, we would have had poor production due to excess nitrogen. All that aside, we still had some obvious differences in our varieties this year. I know I’ve mentioned this variety multiple times over the summer, so it can’t be much of a surprise that it turns up as an easy winner. The flavor is like eating candy, the plants were vigorous and prolific, and the fruit didn’t crack no matter what the weather did. If you like sweet cherry tomatoes, I can’t recommend this variety highly enough. This is the second year that we had Beefy Boy in the garden. It performed well again this year. The fruit were good sized and the yield was also good. Again this year, there was some significant cracking. But…almost everything cracked this year, as most years. 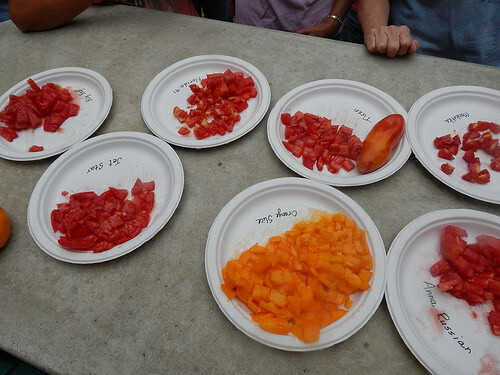 The Tiren tomatoes are the ones that are in the front, slightly to the right of center. Overall, I really liked this tomato. For a large-fruited roma, it was quite prolific and, in fact, still had fruit on it until late this fall. 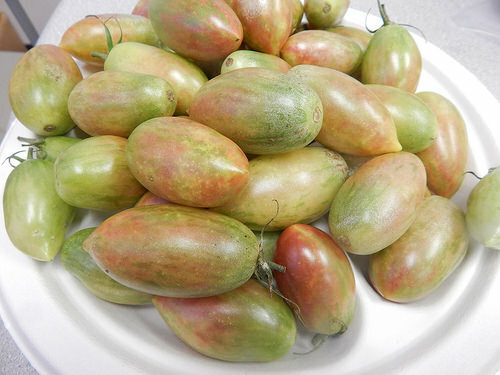 The fruit had very little seed gel, and the flavor was very good for a modern, hybrid roma. 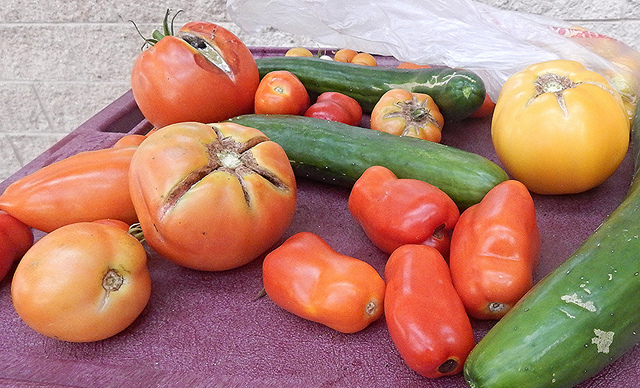 (Believe me, many hybrid romas are not so tasty!) The fruit shape was a little odd. The biggest complaint I have with the variety is that almost all the fruit had a small spot of blossom end rot. Now, this could be largely related to this year’s weather. Or it could be a common, every year occurrence. I didn’t hold it against the variety this year, but if it were to be the same or worse in other seasons, I would probably become less keen on the variety. This variety is another orange slicer, similar to the Chef’s Choice Orange that we grew last year. For whatever reason, I don’t have any good pictures of this variety. The tomato in the upper right corner of the above picture is one of the Orange Slice fruit, although not a fully ripe example. This picture from the tasting day shows the bright orange color much better. It was the clear winner in our tasting with the Master Gardeners. While it had good production, large fruit, and the same tendency to crack as most of the other varieties, I think I would probably prefer the Chef’s Choice Orange over this one. It’s hard to say when comparing one year to the next, but I think the Chef’s Choice was more prolific. Still, this was a good tomato. 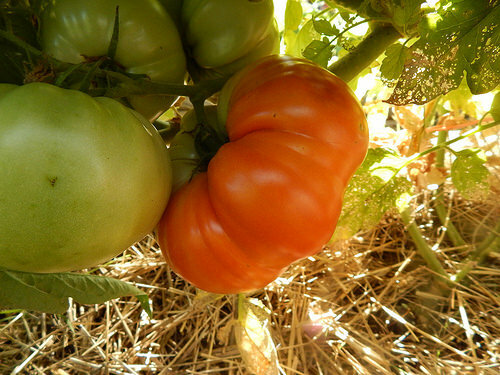 This is one of the “Goliath” series tomatoes, the Original, as you may have guessed. It typically has large fruit, about 16 oz. I would say that it performed very comparably to Orange Slice and Beefy Boy. From a flavor standpoint, I thought it was a little sweeter and less acidic than some of the other red varieties. 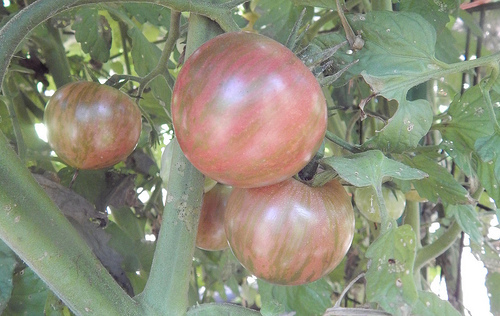 This cherry tomato variety is part of the Artisan tomato series. It has a pink to maroon color with green stripes. For whatever reason, this plant was exceptionally vigorous (maybe too much compost?) and seemed to be not as productive for its size as you might wish. The flavor got mixed reviews. It was much more acidic and less sweet than others. I think the less-than-perfectly-ripe fruit were not as tasty, definitely. Still, it was a fun variety to try growing. I had high hopes for this variety, another in the Artisan series. Naturally, it was a bit disappointing. The Lucky Tiger Cherry was green with a red blush when ripe. Unfortunately, the result was ugly rather than attractive. This variety also cracked terribly and the plants succumbed to disease when most of the others did not. The yield was pretty good, but the flavor also left something to be desired. Highly acidic flavor, but not much else. Verona was marketed as a tomato that was similar to Juliet but even tastier. Without having a true, side-by-side comparison, it is difficult to say for sure. However, Juliet rarely cracks. This variety cracked constantly. Not a good sign! The flavor was nice, but I would be hard pressed to say that it was better than a Juliet. The yield was good, but not the exceptional yield I expect from a Juliet. So…I wouldn’t call this variety the new, improved Juliet! The only picture I have of this plant is from when it was newly transplanted. This variety set almost no fruit, the fruit set was late, and what fruit it did set was cracked and rotten before we could harvest or taste it. There is the chance that the excess compost played a role in the lack of productivity, but I’m going to be hard pressed to want to try this one again. Another one with no pictures! This was supposed to be an improved variety of Early Girl, with an early days to maturity of 52 days. This plant didn’t have ripe fruit until well after most of the other varieties were producing. Could this have been a weather issue? Yes. So try it if you like, but I’m not overly keen to try it again. 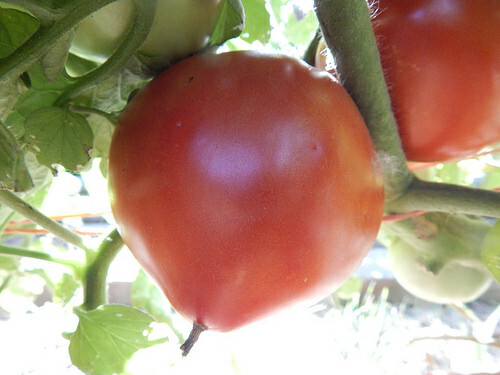 Those are my thoughts on our regular garden tomatoes for this year. I’ll have another post to discuss the container varieties. Posted on October 21, 2016, in Around the Garden, Plant & Garden Reviews and tagged Tomatoes. Bookmark the permalink. Leave a comment.